N. B. – Bell’s will close at 4:00 pm on Tuesday, Dec. 11th for our Staff Holiday Party. We may stay later some days so feel free to give a call at (650) 323-7822 ! Bell’s will be closed Christmas Day and New Year’s Day. Located in downtown Palo Alto, Bell’s has served the Stanford University and Silicon Valley communities, providing new, used and rare books since 1935. With 300,000 volumes housed in an historic two story storefront spilling over with quality hardcover and paperback books in 500 subject categories, there is, quite literally, something for everyone at Bell’s. We have recently acquired a large collection of SIGNED FIRST EDITIONS in fine condition, including works signed by Robert Frost, William Somerset Maugham, Eudora Welty, Presidents Carter and Nixon, Kurt Vonnegut, John Updike, Margaret Atwood, Ruth Rendell, John Cheever, T.C. Boyle, Raymond Carver, and many more. We also have a new massive acquisition of Picasso and Matisse Art Books (partially on display), and a great bunch of World War Two histories. Also: Early Atomic research, Western Americana, Steinbeck first editions and signed Stegner volumes. We would love to help you build a collection of your own. 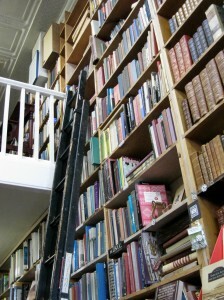 Bell’s purchases fine books and private collections.